An undulating multi-terrain race set in the beautiful Crimple Valley, suitable for all levels. The Run Harrogate 10k is a multi-terrain race set in the beautiful Crimple Valley area of the famous spa town of Harrogate. It follows an undulating route that is approximately 70% tarmac road. The course has been specifically designed to be suitable for all levels of runner and will appeal to those contemplating their first race, but also to seasoned club runners who are looking for a new challenge. 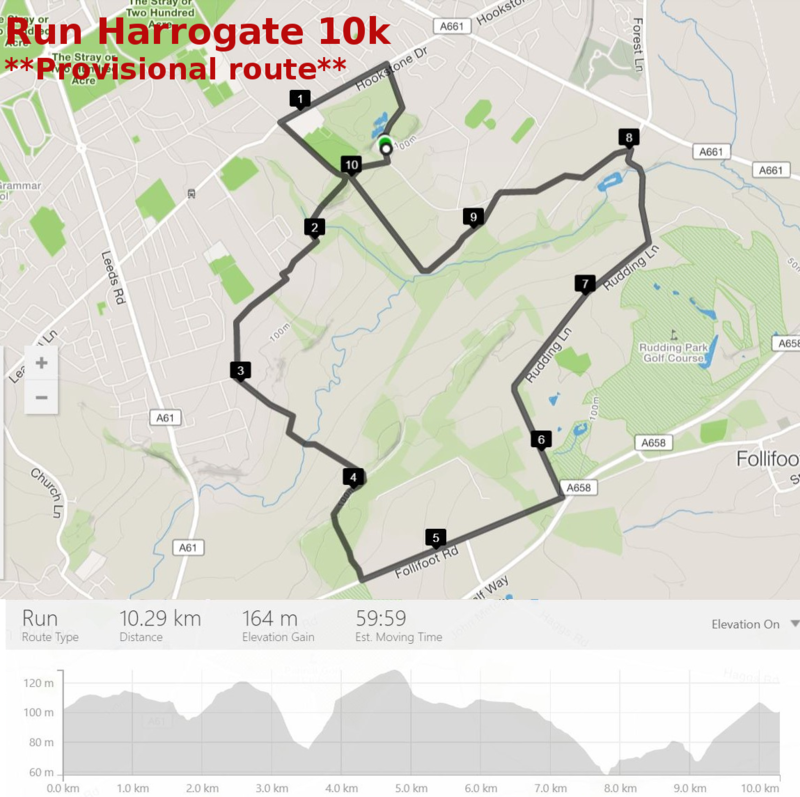 Harrogate Harriers and A.C. offer a cash prizes to the winners of both Men’s and Ladies’ races, plus all age category prizes. We will also be offering a prize to the first corporately-entered team, so start canvassing around the office! Electronic chip timing will be provided by Even Splits. Our friends at Berwins Solicitors have brought the great idea of a Corporate Challenge. Local businesses and organisations are invited to submit teams of 3 to compete for the top prize. The winning team will be holders of the Berwins Corporate Shield for the year and individual team members will each receive a miniature shield. Moreover, Berwins will donate a cheque for £250 to a local charity of the winner’s choice. Route: The race follows an undulating multi-terrain route that is approximately 70% road. On-Line Entries: RaceBest are providing online entry, which closes on June 29th. Please collect your numbers and timing chips from the distribution desk close to the Squash Club Entrance. Entry on The Day: Entries on the day will be accepted (subject to the race entry limit being reached) with a £2.00 surcharge on top of the on-line entry fee, making that £15.00 attached (affiliated club runners) £17.00 unattached. You will find the Race Secretary situated at a desk close to the Squash Club entrance, however please leave yourself plenty of time if doing so. Note that the desk will open at 0800 and close at 0930. Car Parking: Limited car parking is available outside the Squash & Fitness club, also in the immediate locality and to the north of Hookstone Drive. Numbers: Please ensure your number is pinned to the front of your vest/running shirt and that you have filled in the medical information on the back. Do not fold or mutilate your number in any way. Chip Timing: Please ensure that you have attached the timing chip to your shoe in accordance with the instructions provided by Even Splits. Safety: The race will be well marshalled and signposted. On the road sections please run on the left hand side. The roads will be open to traffic at all times. Harrogate Harriers are obliged to follow the direction of UKA and the local police in enforcing a policy that NO iPod or similar MP3 players will be allowed during the race, to include any device that might otherwise obstruct your hearing and jeopardise your safety. Any runner not complying with this important ruling will be disqualified. Medical Aid: A doctor and other medical professionals will be in attendance. Race Finish: The race will finish immediately outside the Squash Club. After crossing the finish line, runners should move quickly into the finish funnel to ensure their time is correctly recorded. Please maintain your finishing order to the end of the funnel, where your number will be recorded. Our 2018 event had fantastic weather, which was great but can cause problems when running a 10K. We strongly recommend you start the race well hydrated and run with an isotonic or water bottle. Obtain medical advice before running if you have recently been unwell. There will be a water & sponge station at around the halfway point 3.1 miles. We have 26 marshal posts round the course who will be connected to HQ if you feel you cannot continue stop at one of these points and you will be collected. If you decide you cannot finish the course and make your own way please hand your number to a marshal so we know you have withdrawn. There is limited car parking at the Harrogate Squash & Fitness Centre HG28PN. Please do not park on the approach road to the centre, which is part of the course. There is street parking in the Saints area to the north of Hookstone Drive. The Yorkshire Show Ground. The Yorkshire Agriculture Society have kindly allowed us to use their brown car park which is found by turning at Sainsbury’s on the Wetherby Road going passed Fodder HG28NZ on an internal showground road until you reach the car park on your left. You then have a 300m walk to the start. Number collection will be at The Harrogate Squash & Fitness Centre where there will also be tea/coffee etc and toilets. The race starts and finishes in front of The Harrogate Squash & Fitness Centre. The race start is 10am. Post race. The Squash Club bar will be open. Feel free to bring picnic tables and chairs. Enjoy the race and be aware and sensible regarding the unusually hot conditions.